Subject description: Unsticky this thread when you can. 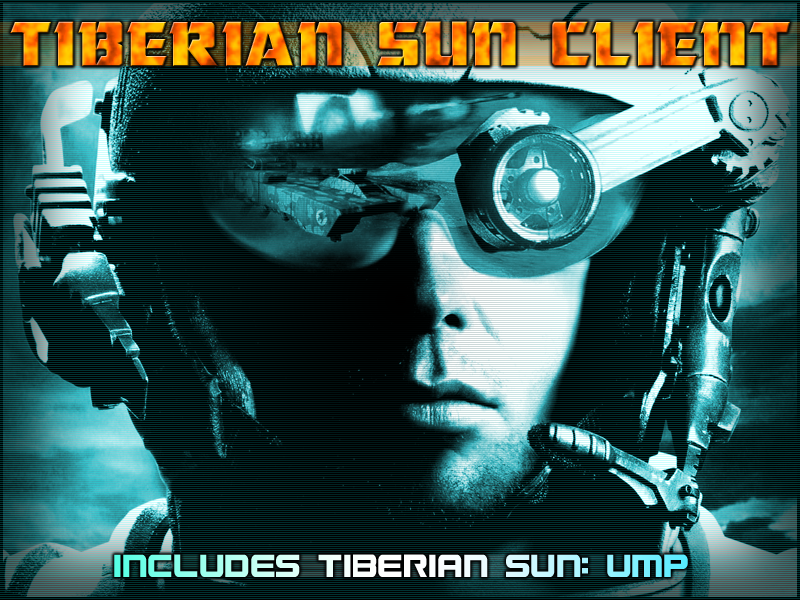 Hello ladies and gentlemen, today I would like to announce that Tiberian Sun: UMP has been merged with the new Tiberian Sun Client. All traces of the UMP's separate downloads no longer exist or have been updated to include and specify the fact that it is now part of the Client itself. 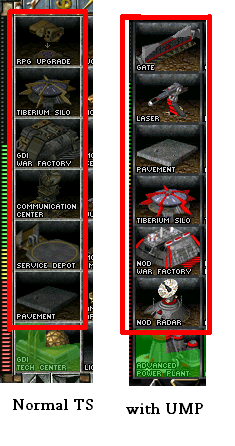 Our ModDB page has now been updated and edited to suit the Tiberian Sun Client's needs. This isn't to say that Tiberian Sun UMP is no longer an ambition, quite the contrary, we will continue to fix bugs in the original Tiberian Sun code and these fixes will be included as a part of the Tiberian Sun Client itself in the future, assuming we come across more bugs in Westwoods codes, which I think we all know is incredibly likely. For those of you that don't know, the purpose of Tiberian Sun: UMP (Unofficial Mini-Patch) is to fix all known (fixable) bugs in Tiberian Sun. The reason that Attack Buggy couldn't crush infantry was to make it on par with the Wolverine. Like the Wolverine, the Attack Buggy is immune to veins as well. As well as you should include a fix for the TS Nod mission with the imprisoned commander, you have to capture a refinery while the harvester is docked, instant dump would break the mission. I've tested the mission, you are still able to capture the Refinery while the harvester is unloading, you just have to be quick. Aro, I'm going to give you heads up. Messing with the values below can have some bad effects on single player missons if you mess with them too much. I set my Rules to the values below and I got Zerg Rushed to no end on the Nod misson "Blackout"
I would recommend against adding a multiple factory bonus as it severely imbalances the game when large amounts of helipads are constructed. As well as you should include a fix for the TS Nod mission with the imprisoned commander, you have to capture a refinery while the harvester is docked, instant dump would break the mission. I know it was overly exaggerated in TS, but I'd rather keep rough and sand as the usual slow-downers, and pavement as the speed accelerator. Well it depends who wants it either way. I know my coding and modding, that's why I didn't set retarded over the top values. For the second time: I've played all the missions from the start to the end with the UMP installed, everything works perfectly and I am yet to come across any errors. For the second time, there is no problem with capturing refineries while harvesters are docked, it still works perfectly fine unless you're turtle-slow. These are OPTIONAL ADDITIONS and so is the Harvester Dumping speed! They can be easily removed and reverted back to normal as I've already mentioned in the first post and in the UMP readme. On that note, I've re-uploaded the UMP with a tiny fix. If you've already downloaded it, download it again. Great, then good work on the UMP, 'bout time TS got a UMP. Retarded over the top values helps Skirmish mode. I already look at your numbers but I did not know if you were going go push them farther. I wont alter the AI values again unless I feel it's necessary, but again, the AI changes are optional additions. Anyway, I've switched the download in the first post. Be sure to re-download. Shouldn't this be in the mod announce forum? Since it's more of a fix than it is a mod, I feel Tiberian Sun Editing is better suited. Well it's a fix still suited to your tastes. Therefore bent to your play style, it's a modification. Eh... faster harvester dumps is good, but instant dumps is annoying. Yeah its not a fix if it mods gameplay. 1) I'd much prefer to have the traditional Tiberium dumping, its just cooler and its what Tib games are all about. 2) Removing the "different speeds on different ground" isnt a gameplay enhancement IMO, since thats a pretty cool feature and should be used a lot more instead of a lot less. 3) RA2 veterancy is good but 4.0 is too low IMO. 4) MaximumQueuedObjects is debatable. IMO it adds some kind of micro-management to building things, which isnt a bad thing. Uploaded UMP 0.1a. Simply removes all optional additions and enhancements and maintains all bug fixes from 0.1. Nice to see that a successor to TS 3.0 of sorts was made. I should go dig that mod out one day and make it a random gagglefuck mod... one day. In case somebody would try to play an old mod,what's needed to do about the patch? Leaving any file that isn't overwritten? Remove only specific files and leave the others,unless they're overwritten? Well assuming this is a proper mod you're talking about, yes, you'll need to remove the UMP. This is more of a base for starting a new mod. 0.2 Uploaded, check first post for changelog. I decided to remove all the optional additions and just stick to the bug-fixes. I disagree with the removal of the changes, personally. If you could spice up the gameplay and have it pull away from being GDI oriented online, I think that'd be nice. Well the idea is to set up a bug-free TS for modders, it was never intent to be a balance mod (though I've been tempted to get carried away). I've left MaximumQueuedObjects bit lower (15) since TS has a very annoying bug. If you run out of money while a unit is about to begin its construction, the construction goes on hold state and doesn't continue building even if you get money again. Too many times I've ordered 10 tanks only to come back 5 minutes later to notice only 1 have been built. A lower limit might make you check the construction progress more often. For the third time: I've removed all optional additions (I'm getting really sick of saying those two words). As for the build Queue bug, that's always existed, regardless of how great the value is. It's in Vanilla TS and Red Alert 2. I thought raising this limit was part of the core changes. Personally I do think MaximumQueuedObjects should be raised by this "patch" since 5 is just an artificial and quite annoying limitation. Was just saying have to be careful with the limit because of this bug. Sure it happens in Red Alert 2? I don't ever recall having it happen in there. The bug is always there regardless of the value (unless you only allow yourself to queue one unit at a time like in TD), it's annoying but there isn't much that can be done about it. Yep, I'm possitive it's also in Red Alert 2 (Not sure about Yuri's Revenge) cause it's cost me more than one game online. After trying the patch,I found all my skirmish maps going in english. I figured it was because of missions.pkt,so I went around in .mix files and gathered the data to make my own missions.pkt with the french names. I know the quantity of persons interested by this AND coming in this forum must be incredibly low ,but I still share it just in case. Something that bothered me with this patch is the harvester harvesting animation. That green smoke isn't good,it looks more like tiberium gas,and it feels really wrong when harvesting blue tiberium. edit: I checked in that some more,taking screenshots and comparing them. After all,there doesn't seems to be any real transparency difference. I looked for things in rules.ini or art.ini,workarounds and/or enhancements using the wrong palette,that would have been proofs that it would be a hack rather than an error,but I didn't find those. Yet it's still possible this "error" was made of purpose (I don't know if it would be hard to get the same gray on the normal palette),there are unfinished things,hacks and workarounds in this game after all. I will keep the "wrong palette" version. I don't create a new post to say all that,since considering this fix right or wrong will depend on the feedback about it. You are aware that the harvesting animation was actually in the wrong palette right? The green color is how the animation was originally supposed to look. But of course you could always change it back to being in the wrong palette if that's how you prefer it. Oh, a bug you need to write off is all the mutant infantry (MUTANT, MSGT, and MWMN) use a fire anim for their weapon while they still crawl and thus need it removed. The Mutant and Mutant Sargent SHPs have a firing anim build in but the Mutant Soldier needs one, I believe I posted a fixed SHP in the SHPs section here that added a firing animation. Dug through the SHP forums and found it here. I just notice that another problem with this patch icon not darken when build building. I check around problem is from "darken.shp" in ecache02.mix. Is this mistake? That cuts down a heap of lag. Certainly is not a mistake. Yeah, TI has a similar fix. Anyhow, you may want to change it to something so you can see if you've already build a hero or the hero is dead yet. Other than that, basic building has no use for it. So that's what darken.shp was for. I never actually realized its significance. I think a small black cross (like the one here: http://www.tiberiumweb.com/forums/index.php?s=&showtopic=3752&view=findpost&p=44746) would be better than an empty darken.shp, since you can't know if you've already built your Mammoth Mark II or not. Not a mistake, it prevents a serious lag issue occurring in-game. Is it happen only on MP? I won't notice any different on lagging with that. It happens during both Singleplayer and Multiplayer for me. Yeah, try building pavement a few times and you should notice lag. Maybe just my PC, I never have issue of lag that cause by darken.shp. I change game speed to 1-6 speed I never notice any lag. Me neither, but some have much more problems with lag. And not only caused by darken.shp, but by transparent stuff in general like transparent explosions or fading out traileranims. The same is true for the bright glow effect caused by explosions. While I don't have any lag at all even with hundreds of them appearing at the same time, do others from the TI staff have lags with these too, that's why we had to disable the weapon glow completely for TI. It's even been in C&C1 and RA1, before the build queues. If you have no money at the moment a unit starts building, it goes on Hold. Heck, in Dune II, automatic construction continuing didn't even exist; you ALWAYS had to manually restart them if they stopped due to low funds. So it was the darkened icons all along that caused such massive slowdown when building stuff? I never knew that. GameMaster0000: Not sure if he cares much about pre-existing mission bugs... this patch is made as clean slate for mods. Yup. Not just the darkening layer, but also the clock animation that are drawn on the icons slow the game down (not that significantly in older computers). where do they go, as in what MIX name ? also does UMP allow normal play of TS and FS as before ? Simply copy the patch (all files of it) into your TS folder. There is no further editing necessary to make this patch work. Yes normal TS and FS play are possible. The only difference is, that you can now use the firestorm units in TS too. hmm how come ecache02 isn't needed in expand02 ? and will it work fine if I put it there ? If you don't mind me asking, what exactly are the contents of missons.pkt and multi01.pkt?